The tight walkway of the Boudhanath had my elbows tucked as the flow of people sped past in ways unbeknownst, enveloping me. The bright orange and red shawls shimmering from shoulders, the sounds of a city growing out of its seams, and the smell of spices and diesel drew my focus. As these roiled over each other for my attention, I tripped, losing my feet as I tried to catch it all. The samosas drew me in by smell and their golden colour crisping in a deep cast iron pan of oil. The oil, over time, had flowed down the sides reaching the floor. The smoke had filled the hole of a building numerous times. Everything was black, almost overly soot-covered, intensely used. I focused my camera on the man’s hands as he dipped new batches and removed finished ones out of the oil. In between, he wrapped piping samosas in a newspaper, calmly and purposefully, as if they were presents being shared between the only two people in the world. This juxtaposed his surprised patrons as they juggled them on the edge of burning fingers but still intoxicated by the almond-spiced smell emanating from within. I watched this interaction and raised my camera. As life flowed busily around me, the man caught me eyeing his work. His grey hair was fading to white at the tips as if he’d recently been electrocuted and eyes lit like candles were more than I could bear. I was intimidated, I started to turn to leave; to melt away. He beckoned at me instead. His eyes were rivalled by a matchstick smile. We didn’t speak the same language, but I could tell by his soft gestures he was excited I had noticed his work. I stood around his shop finding new angles to shoot from I hadn't seen before as we bent around each other. I showed him a few images, his eyes lighting up even more. Travelling for me has been a lifelong endeavour, an innate desire and I have been fortunate enough to be able to sate it consistently. It has brought me through near thirty countries on almost every continent. Some I’ve lived in, others I’ve worked in. Until this spring my photography had amounted to an iPhone snap, always self-conscious and quick. I dove into the DSLR world by way of Sony’s A7 III only having been given a light introduction into the three tenants of producing a decent photo. Thus, I am an amateur growing into my gear by way of attending a Photography Without Borders tour of Nepal. Our group toured different cities of the greater Kathmandu Valley, trekked through the Annapurna Range, and explored hamlets along the way. It was varied from street photography to vast vistas that boggled the mind, with lots and lots of vertical gains and losses in between. Our first few days in Kathmandu we entered each one with a lens for success, focusing through PWB’s Code of Ethics to give us a solid baseline to start from. What is the right way to photograph someone in a different culture than your own? For more seasoned photographers this came second nature, for me, how to take a picture of someone on the street without getting in their space or feeling uncomfortable was something I had spent little time mulling over before I was in the moment. Time and time again I took chances that grew to feel normal. By engaging with everyone I could while capturing images, I met many more people than I had during past travels. I looked for details that before were just part of the scenery, but now were interesting sub focuses to capture from a unique angle. When I felt I had gotten in someone's space or wasn’t sure if photographing someone who was in need, I was surrounded by a great group of fellow travellers I could lean into and learn from their shared experiences. 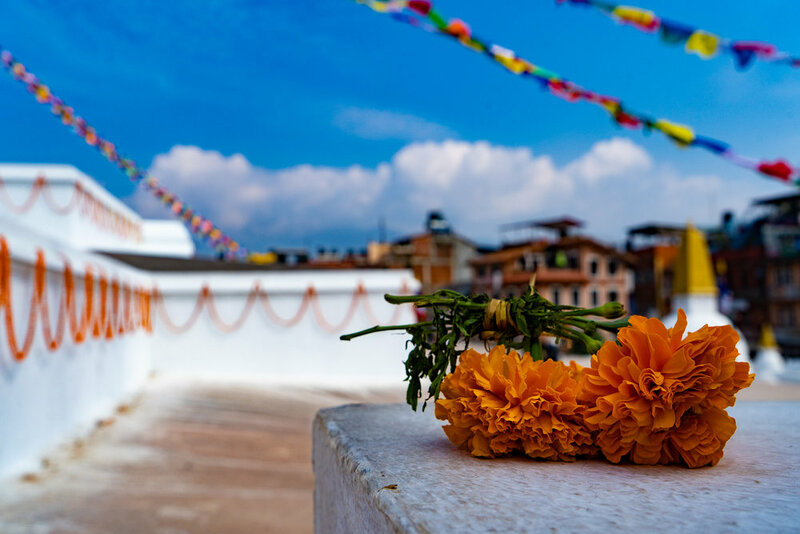 Having taken the time to review my images throughout the trip, I noticed the polarity between Nepal’s tension holding onto its past, its deep culture, and its need to modernize alongside our quickly globalizing world. The traditional is not gone, nor is the sleekness of modernity taken hold quite yet. Capturing these moments in a still frame freezes this unique blend, and allowed me to slow down and really take it all in. I noticed many times after, I raised my camera and saw the world differently than I had a few days before. The details and small moments between people flew at me. By learning with PWB how to look through my lens differently, my way of travelling changed for the better. Will Stirn was one of the participants who traveled to Nepal alongside PWB and photographer and archeologist Matt Stirn this past Fall. To hone your own photography skills while working with our partner NGOS, checkout our list of upcoming PWB Schools including workshops in India, Mozambique and Guatemala.